UP TO three hundred innocent people are feared to be trapped in John Roberts Square today after a team of strategically placed charity workers invaded Waterford city at around 10am. Brandishing fake smiles and clipboards, the team of three men and four women surrounded the pedestrianised city square this morning, cleverly ignoring passers by entering the ‘trap’. It has been reported that once people are inside, they are then confronted on all exit routes leaving the square. Gardai have told WWN that all exits, including Georges Court, has been targeted by the gorilla charity group. Garda Walsh added that supplies of food and water will be transported into John Roberts Square later on this afternoon. Worried family and friends of the victims were asked to stay vigilant and not to try anything stupid. “My wife has been trapped there for 4 hours now.” said 35-year-old Thomas Keane. However, some people did manage to escape the square unscathed – businessman George Kinsella told WWN earlier that he snuck out by just pretending he was on the phone. He said “I caught your ones smiley face in the corner of my eye. “Luckily I had my shades on, or the leech would have seen me. “I immediately put the phone up to my ear and started talking. She waved frantically. I shouted down the phone as if I was angry. I could hear her saying: ”scuse me sir, do you have a few minutes?’. I just kept walking towards O’Connell street. She threw herself down onto the ground and bear hugged my leg. I dragged her for several feet before eventually slamming her off a bin outside T&H’s. Another man stated he got out through the side door of Supermacs, but reports have come back saying that it is now also covered by one of the charity workers. 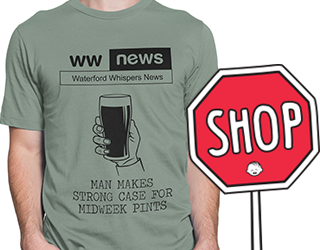 WWN will give up-to-date bulletins between now and 6 o clock. If you are concerned about any family member or friend, please ring Ballybricken Garda station on 051-305311.